US Tours and Travel has been working as a global wholesale tour operator for more than 30 years in USA and Korea focused more on inbound travel business. We are the company many of the world's leading travel agents trust to look after their customers not only in Korea but also in China and all parts of Asia through our branch offices and partner travel agencies. 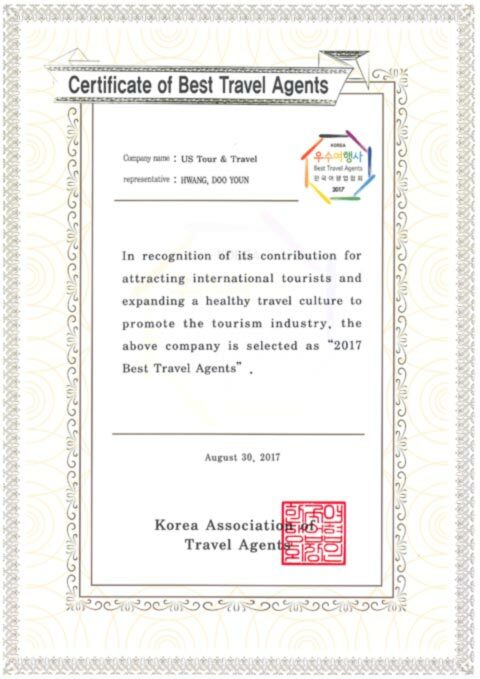 Providing a variety of quality services including North Korea Tour, air tickets, hotels, transportation, foreign language speaking guides, sightseeing tours, meetings and conventions, KR Pass (similar to Eurail Pass), rent-a-car and so forth, we strive to conduct our business in an honest and fair manner for the sake of superb customer satisfaction. What makes us different from other travel agencies is that our tour services are available at exceptionally affordable prices for even FITs in the countryside as well as Seoul by regularly departing joining tour programs and that our competitive room rates of hotels are another big benefit for our customers. I am sure that our qualified staff with professionalism will certainly help to make our customers' holiday dreams come true. Thanks.